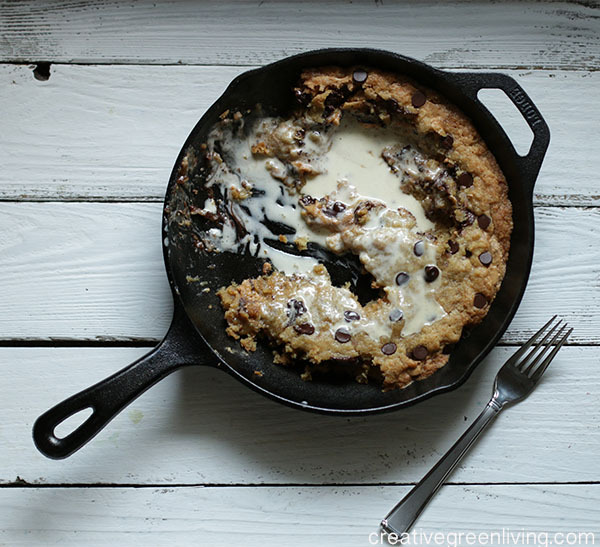 Grease a 10" cast iron skillet well with butter or coconut oil. In a stand mixer, beat your butter and sugars together, then add the vanilla and eggs. Turn the mixer off. Add your flour, baking soda, and salt all at once. Mix until the ingredients have just come together. In a medium sized bowl, combine the peanut butter, powdered sugar and 1/2 cup of the chocolate chips. 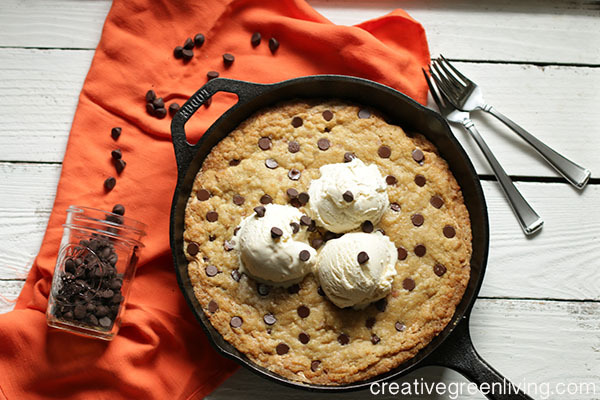 Take 1/2 of the cookie dough, and lay it down in a smooth layer over the bottom of your greased cast iron skillet. Sprinkle it evenly with 1/4 cup of chocolate chips. Now carefully spread the peanut butter/chocolate chip mixture in an even layer over the first layer of cookie dough. Carefully spread the second half of the cookie dough over the top of the peanut butter layer. Top with chocolate chips. 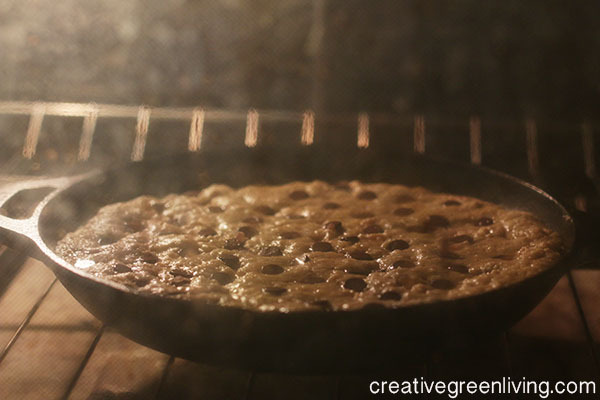 For best results, push the chocolate chips into the dough, pointy side down, in nice, even rows, about an inch apart across the entire top of the cookie. Sprinkle with a light dash of sea salt. Bake in the hot oven for 15-20 minutes. Keep a close eye on it as you approach the 15 minute mark, and possibly put foil over the top, if the edges are starting to get too dark. Once the center looks set, just as the it loses the shiny and wet look, remove it from the oven. You want the center to be very soft, and almost cookie-dough like. 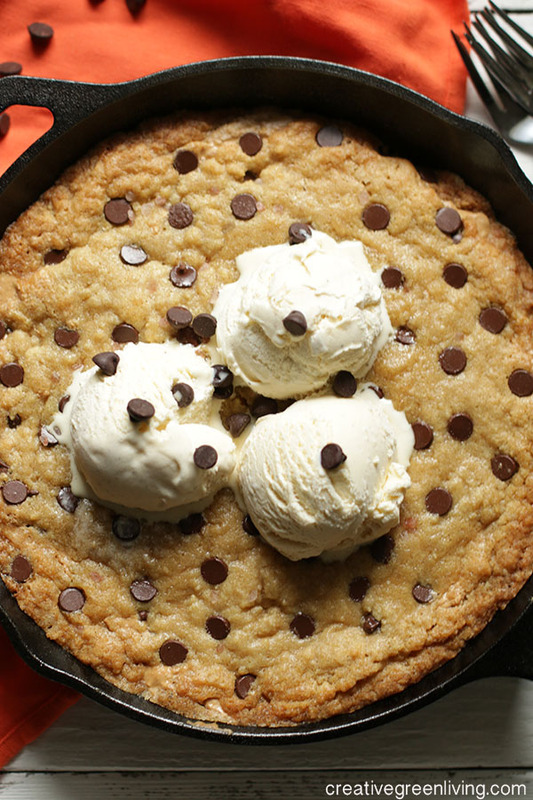 As soon as you pull it out of the oven, scoop several large balls of organic vanilla ice cream and put them on top of the pazookie. Serve immediately! Serves 6.